The African World Heritage Fund and the UNESCO World Heritage Centre in partnership with the Robben Island Museum invite applications for participation in the first Regional Youth Forum on World Heritage in Africa taking place from the April 24 to May 4, 2016 at the Robben Island World Heritage Site in Cape Town, South Africa. This forum will address young people and seek to provide a sustainable platform for youth in Africa that could increase the involvement of youth in the promotion and protection of World Heritage in Africa. The forum would also deliver essential feedback to UNESCO, the World Heritage Committee and the African World Heritage Fund (AWHF) on youth challenges, accomplishments and actions related to the implementation of the World Heritage Convention in the region. 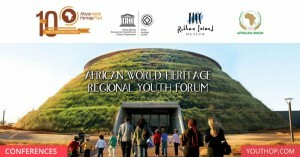 This is the first regional youth forum on World Heritage in Africa. It will address Anglophone youth. A second forum is planned for 2017 targeting francophone youth in Africa. Lectures and presentations from experts and heritage specialists will provide an introduction to the 1972 World Heritage Convention, the Action Plan for World Heritage in the Africa Region, and the challenges of conservation and development. Hands-on / practical activities that provide some basic skills on heritage conservation, preservation and/or promotion of African heritage. Guided visit to an African World Heritage site with expert input. Presentations by the participants on heritage related issues in their own country. Participation in a Youth Model of the World Heritage Committee, an educational simulation drawing attention of the young people to the issues related to heritage preservation and promotion in the Africa region and how the World Heritage Committee works. The costs for the forum will be covered by the organizers; the African World Heritage Fund and Robben Island Museum (i.e. airfare, accommodation, meals and local transport within South Africa during the forum). Individuals passionate about heritage in their country. The working language for the forum is English. *A French-speaking forum is planned for 2017 in Africa (subject to the availability of funds). Your videos should be: creative, innovative, surprising, but most important of all is to have fun! Clip length 2 minutes maximum and format: “AVI” only. NOTE: Applicants will be selected by a jury consisting of representatives from the African World Heritage Fund (AWHF), Robben Island Museum (RIM), UNESCO World Heritage Centre, and the African Union. Successful applicants will be informed by 26th February 2016 at the latest.